I went on a free tour yesterday that cost me Five Euros; it was very good because the little guy born in Winnipeg, Canada with three passports, Canadian, Ireland, and England however claiming in his use of language Germany as his country was extremely passionate. However you do it, he told a great story of Berlin Wall, very interesting in a demagoguery sort of way. The facts were adapted as necessary in the normal touristy fashion. 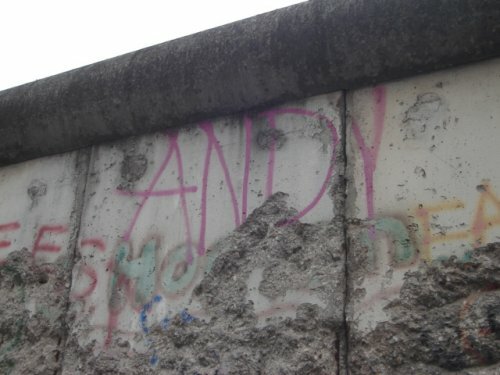 The Berlin Wall though was a symbol of anger to me, your side again my side and I am very grateful it came down. My idea of Anger, as I took this photo just across the street. This seems angry to me, whether on to of a wall, or as a Tattoo. I would say this guide is great at what he does, full of passion. It is great to see a person with energy. It was an experience to watch. I felt like our guide was a hung over tree hugger, injected caffeine, fuzzily dreaming the story, not sure, if he was awake from today or yesterday. There is a passion to behold when you would tell an Irish boy he won’t be getting a pint tonight until he tell the perfect story, thus we go a great story. They work for donations so he spun the story. The Berlin Wall was a real and imaginary line around the planet. One side was Russia and China, the other side was the USA, England and France. 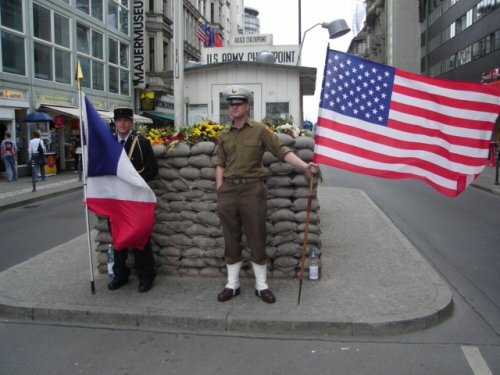 A line was drawn, the symbol was the wall, and Check Point Charlie was the door. As long as the wall and the door existed, the imaginary wall of fuzzy misguided anger could and would exist between Russia and the USA. There are three Soldiers at this spot, American, British, and French, three brothers who worked together to fight the people of Germany. They are still here waving the flags, and still form a solid wall again any future problems. 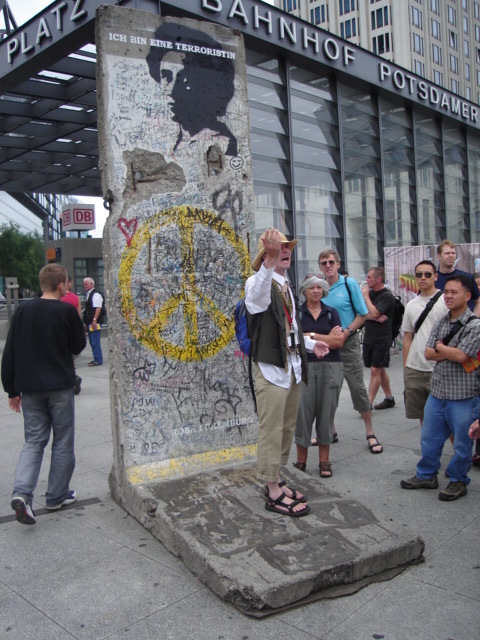 Checkpoint Charlie was a checkpoint for people allowed to travel between East and West Germany, or more clearly between Russia and the USA, between what represent repression to what represents freedom. Like leaving the jail and seeing the Statue of Liberty as your first view. This was the gate. 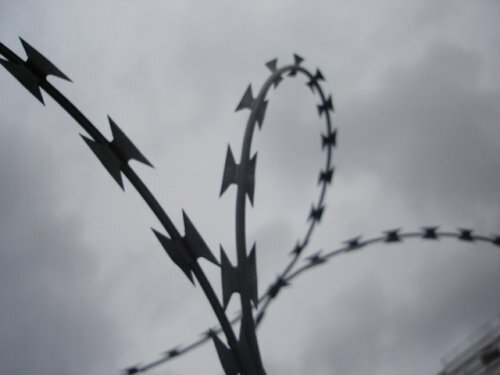 The gate is no longer needed and Russia is allies thanks to people like Ronald Reagan and The Bushes, father and son. To me this is clear, there are some bad guys on the planet, and a very few will stand up and say no, not on my watch. The Germans People Killed 6-7 Million Jewish People. 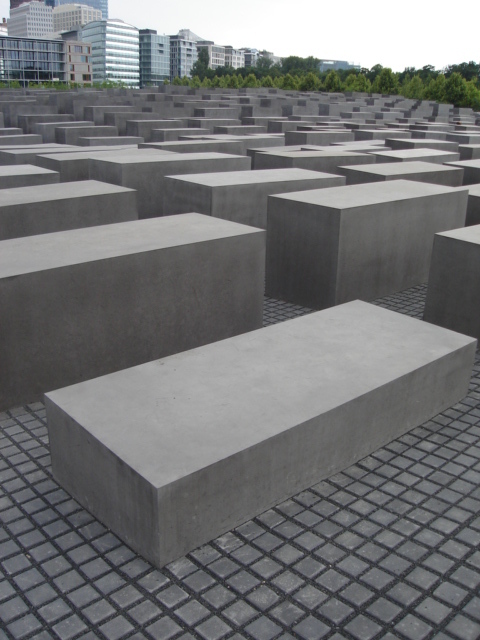 This a memorial to that Genocide or Holocaust, the German People have constructed in the middle their city a monument with 2711 stone like caskets. Bleak, sad, and dramatic, each a different height, very organized, very cut and clear. A perfect box like representation of the death of the Jewish people in concentration camps. The shame of the German People for trying to in German like manner, organized, precise and cold, they tried to exterminate anyone different then them. This I hope serves as sufficient reminder. Not on My Watch - About 4000 bodies buried here in Iraq. 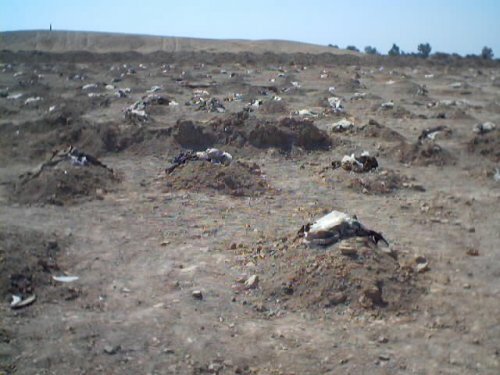 This is my witness of Iraq as seen north of Hila or Babylon, a Mass Grave made by a man that is almost identical in behavior to Adolph Hitler; they could have been Brother, Sadaam Hussein. Extremely difficult for me to fathom that anyone would allow this monster to exist in their world. However, a few will always say, no matter the person consequences or the cost.